This is a beautifully executed portrait of a young woman named Eliza (Gove) Porter. This painting done in watercolor on ivory shows her wearing a black dress, the folds highlighted with gum arabic, the neckline adorned with lace and wearing diamond and gold earrings. Every detail is finely and carefully done. Her blue eyes with the large irises are particularly compelling. She is serious, but not stern as a hint of a smile plays around her lips. 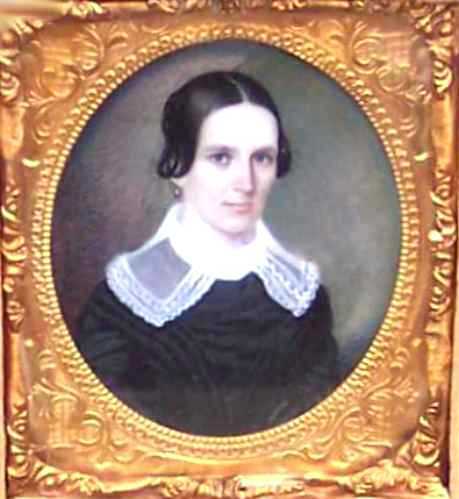 Eliza was born on Sept. 4, 1799 in Fairfax, Franklin County, Vermont. She was the 4th of 12 children born to Nathaniel Gove and Sally Osgood. She married George Flagg Porter who was an attorney at law and they had five children. Two were born in Vermont and the other three were born in Detroit, Michigan where the Porters moved sometime between 1832 and 1840. The 1850 Census shows the family living in Detroit with their five children. George was an attorney at law and apparently a successful one as the family employed two servants to help Eliza with the housekeeping as well as the care of the five children from this union. 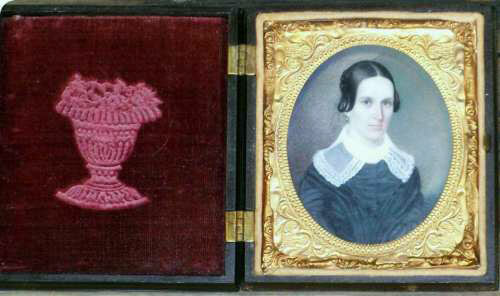 This miniature is one of two that came out of a Michigan estate with another of George Flagg Porter, Eliza's husband. 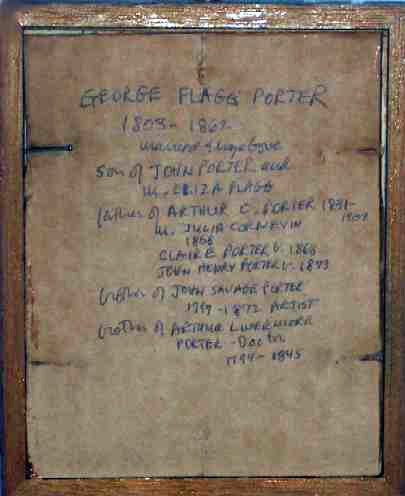 A portion of his family history is written on a piece of backing cardboard on his portrait and is shown below. The Porter family was an important one in the Detroit area with members of it being politicians, physicians, attorneys and industrialists. This extremely fine example is in excellent condition. The sight size of the painting is 2-5/8" by 2-1/8" It is housed in a 3-3/4" by 3-1/4" A.P. Critchlow daguerreotype case which is also in superb condition and still retains its original label in the interior under the painting.